A night after Manny Pacquiao and Floyd Mayweather Jr. crossed paths at another NBA game, speculation intensified regarding a possible Pacquiao-Mayweather rematch. One reporter after another asked Pacquiao about boxing Mayweather again during his media day Wednesday at Freddie Roach’s Wild Card Boxing Club in Hollywood, California. Each time, Pacquiao politely responded by stating that he is fully focused on defeating Adrien Broner in their 12-round welterweight title fight January 19 in Las Vegas. If Pacquiao beats Broner, there figures to be more interest than ever in a second bout between Mayweather and Pacquiao. Mayweather claimed following his first-round knockout of Japanese kickboxer Tenshin Nasukawa in their boxing exhibition December 31 in Saitama, Japan, that he’ll remain retired. Previously, however, the undefeated five-division champion expressed interest in a rematch with Pacquiao. 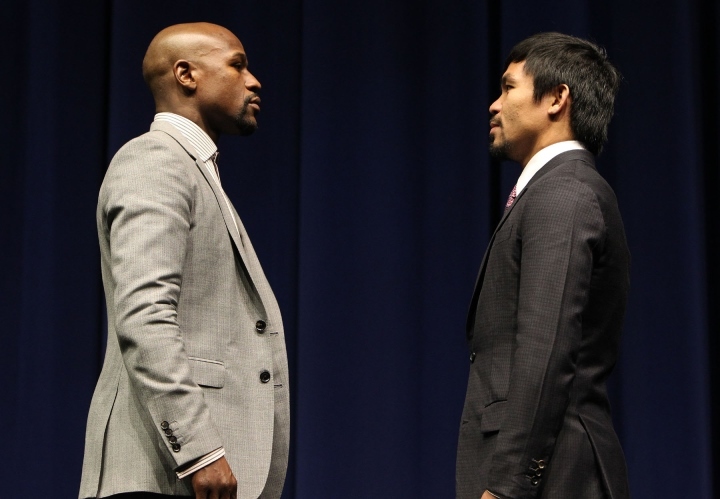 Mayweather’s Instagram post in mid-September indicated that he and Pacquiao had all but agreed to fight again after talking at a concert in Tokyo. Mayweather will turn 42 on February 24. The Grand Rapids, Michigan, native hasn’t competed in an official fight since he stopped UFC superstar Conor McGregor in the 10th round of their August 2017 bout at T-Mobile Arena in Las Vegas. Opposing Pacquiao again could entice Mayweather (50-0, 27 KOs) to end his third retirement because it still is the most lucrative event that can be made in boxing. Their first fight was a critical failure, but an enormous commercial success because it generated more than $600 million in overall revenue. Pacquiao, meanwhile, is in the process rebuilding his brand following his controversial loss to then-unknown Australian Jeff Horn in July 2017. The Filipino southpaw scored his first knockout in 8½ years when he stopped Argentina’s Lucas Matthysse (39-5, 36 KOs, 1 NC) in the seventh round July 15 in Kuala Lumpur, Malaysia. The 40-year-old Pacquiao (60-7-2, 39 KOs) is a 4-1 favorite over Broner (33-3-1, 24 KOs, 1 NC), who drew with Jessie Vargas (28-2-2, 10 KOs) in his last fight, April 21 at Barclays Center in Brooklyn. Mayweather’s promotional company is involved in the card headlined by Pacquiao-Broner. Showtime Pay-Per-View will distribute it as the main event of a four-fight telecast from MGM Grand Garden Arena a week from Saturday night.